Actor Eddie Redmayne, who played Hawking in the 2014 bio-pic "The Theory of Everything", read from the Bible at the service attended by around 500 people. Film stars, supermodels, comics and astronomers joined Stephen Hawking's family and friends for his funeral in Cambridge Saturday, the city where he dedicated his life's work to unravelling the mysteries of the universe. [post_ads]The theoretical physicist who captured the imagination of millions around the world died on March 14 at the age of 76. His death triggered a flood of tributes from Queen Elizabeth II to NASA, reflecting his impact both as a scientist and for his refusal to give up in the face of crippling motor neurone disease. Hawking was famously an atheist but his children Lucy, Robert and Tim chose the church of St Mary the Great to say their farewell. "Our father's life and work meant many things to many people, both religious and non-religious," they said, adding that for that reason the funeral was "both inclusive and traditional, reflecting the breadth and diversity of his life". Hundreds packed the streets and applauded when Hawking's coffin arrived, carried by six porters from his university college, Gonville and Caius. White lilies representing the universe and white roses for the polar star were placed on Hawking's oak coffin. The church bell tolled 76 times, once for each year of his life. Actor Eddie Redmayne, who played Hawking in the 2014 bio-pic "The Theory of Everything", read from the Bible at the service attended by around 500 people. Queen guitarist Brian May, model Lily Cole, comic Dara O Briain and US film producer Barbara Broccoli, known for the James Bond movies, were among the mourners. "He inspired people with the excitement and importance of pure scientific enquiry and was admired and revered for his devotion, as a scholar, to the pursuit of knowledge," Professor Fay Dowker, a former student, told mourners. "His influence and legacy will live forever." A thanksgiving service will be held at Westminster Abbey in London on June 15, when Hawking's remains will be buried near the grave of another legendary scientist, Isaac Newton. Among the well-wishers outside, many praised Hawking's achievement in expanding the boundaries of knowledge. "He's made a major contribution to thinking about space, the black holes, to the whole atmosphere," lawyer Trevor Angle told AFP, noting, "He has had a major rethinking influence in the way people think about science and the wider world we live in." Professor Chris Imafidon, who consulted Hawking in 2007 about encouraging higher level mathematics students, said: "He is not just a scientist; he is an inspiration. He was very humble, very modest, but his thinking is far, far ahead. Too far for this generation. He sees 100 years in the future. "That's what is painful because there's nobody that can do that now." Mike Meylan, a New Zealand mathematics professor visiting Cambridge University, brought his children to explain Hawking's genius. "We live in a world where so much of what's celebrated is trivial and unimportant and it will pass away," he told AFP, adding, "But what he contributed will last so much longer." Hawking was confined to a wheelchair, almost completely paralysed and unable to speak except through his trademark voice synthesiser. He was diagnosed with motor neurone disease aged 21 and defied predictions that he would only live for a few years, although his rare condition -- amyotrophic lateral sclerosis (ALS) -- gradually robbed him of his mobility. 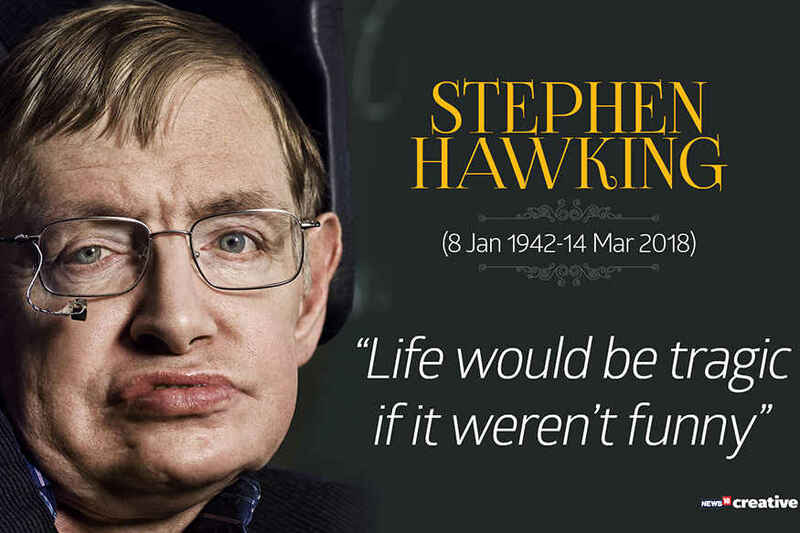 But the illness did nothing to dull his mind, and Hawking became one of the world's best-known and most inspiring scientists, known for his brilliance and his wit. His work focused on bringing together relativity -- the nature of space and time -- and quantum theory -- how the smallest particles behave -- to explain the creation of the universe and how it is governed. But he was also a global star -- his 1988 book "A Brief History of Time" was an unlikely worldwide bestseller, and he appeared as himself in television shows from "The Simpsons" to "Star Trek: The Next Generation".